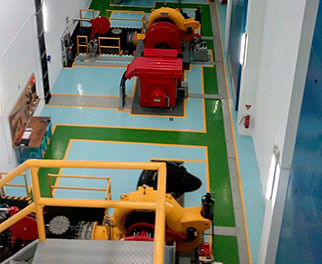 PT Megapower Makmur (MPOW), a subsidiary of Bina Puri Holdings Bhd (BPHB) was established in 2007, operates hydroelectricity and diesel plants in Indonesia. It started commercial operation in 2010, when it obtained contract from Indonesia state-owned electricity company, Perusahaan Listrik Negara, PLN in Pulau Bangka Belitung, Indonesia. Beside micro diesel-generated power plant, starting from June 2016, MPOW is also operating a 4.2MW Mini Hydro Plant in Sungai Bialo, Desa Pattaneteang, Kabupaten Bantaeng, Sulawesi Selatan. 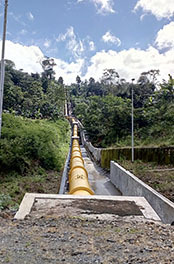 PLTM Banteng-1 mini-hydro power plant is a "Run-off River" type of power generation plant. The length of this green renewable energy power plant is about 1.7 KM from weir to its power house location. The Power Purchase Agreement (PPA) tenure is for 15 years and the contracted annual output of electricity produced is approximately 23,913GW/h. The Group has achieved its latest milestone when MPOW, an Independent electricity producer made its debut on the Indonesia Stock Exchange (IDX) on 4th June 2017 making the First Non-Government Link Company (Malaysia, GLC) to successfully listed on the Indonesia Stock Exchange (IDX), Bursa Efek Indonesia. MPOW listed 245 million shares (30 percent) under the code MPOW, with an opening price of Rp 340 (RM 0.11 ), up 70 percent from the offering price of Rp 200 per share. After the listing, Bina Puri Holdings Bhd through Bina Puri Power Sdn Bhd owns 56 percent of MPOW.